Every time you think you've seen all there is to see of Saturn and its moons, the Cassini imaging team goes ahead and blows that notion right out of the water, along with your mind. 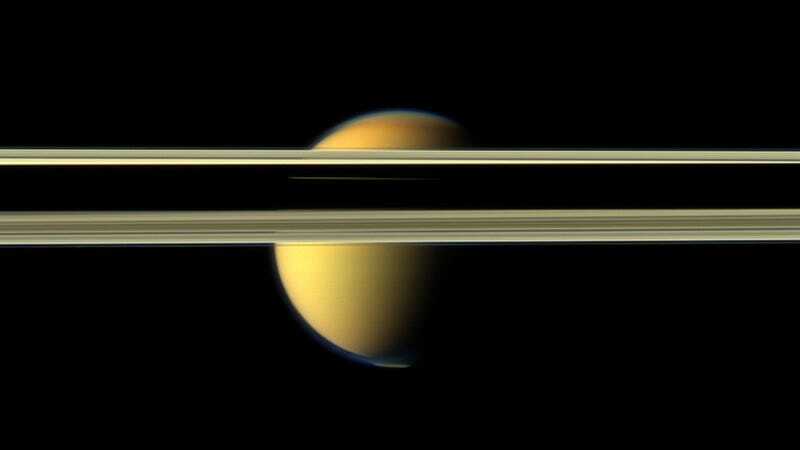 In the series of images featured below, Saturn and its giant moon, Titan, show their true, jaw-dropping colors. Note that our presence at Saturn for the last eight years has made possible the sighting of subtle changes with time, and one such change is obvious here... As the seasons have advanced, and spring has come to the north and autumn to the south throughout the Saturn system, the azure blue in the northern winter Saturnian hemisphere that greeted Cassini upon its arrival in 2004 is now fading; and it is now the southern hemisphere, in its approach to winter, that is taking on a bluish hue. Absolutely stunning. For more info on each of these photos, head over to CICLOPS, where you'll also find their massive, hi-res versions.